Try our Natural Tektites Satisfaction Guarantee - compare our tektite prices and our superior quality. Select a genuine tektite image below to enlarge it. Libyan Desert Tektite Dimensions: 3.2" x 1.3" x 1.2"
This fine quality natural Libyan desert glass tektite is semi-transparent to transparent with very interesting inclusions. See an opposite side view of this fine specimen of natural Libyan desert glass. See also another view of this genuine Libyan desert glass tektite. It has wind-blown sand sculpted surface features in very good condition and golden yellow natural color. Libyan desert glass tektites are a wind sculpted silica-rich natural glass thought by scientists to have been formed by the intense heat produced during a meteoric aerial burst over sand in western Egypt approximately 28.5 million years ago. Libyan Desert Tektite Dimensions: 2" x 1.7" x 1.3"
This fine quality natural Libyan desert glass tektite is semi-transparent to transparent with very interesting inclusions and surface features. 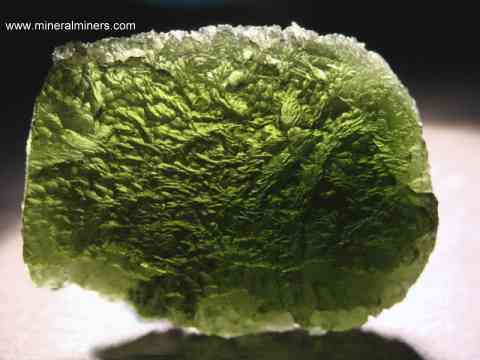 See an opposite side view of this fine specimen of natural Libyan desert glass tektite. 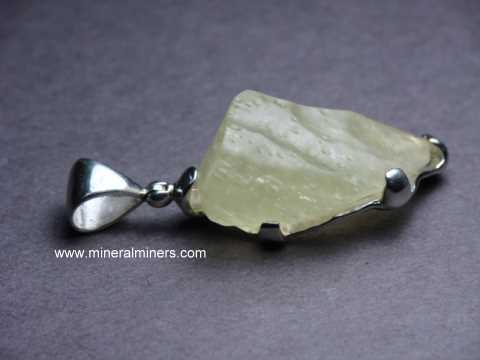 See also another view of this genuine Libyan desert glass tektite. It has wind-blown sand sculpted surface features in very good condition and golden yellow natural color. Libyan desert glass tektites are a wind sculpted silica-rich natural glass thought by scientists to have been formed by the intense heat produced during a meteoric aerial burst over sand in western Egypt approximately 28.5 million years ago. Libyan Desert Tektite Dimensions: 2.1" x 2" x 1.5"
This fine quality natural Libyan desert glass tektite is semi-transparent to transparent with internal layers of inclusions and very interesting surface features. 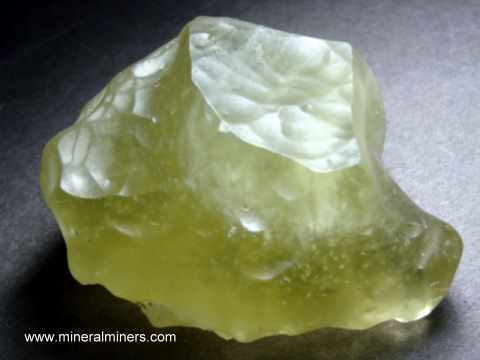 See a side view of this fine specimen of natural Libyan desert glass tektite. See also another view of this natural specimen of genuine Libyan desert glass. This tektite has a blocky shape and would yield a 1.25 inch diameter sphere. It has wind-blown sand sculpted surface features in very fine condition and golden greenish natural color. Libyan desert glass tektites are a wind sculpted silica-rich natural glass thought by scientists to have been formed by the intense heat produced during a meteoric aerial burst over sand in western Egypt approximately 28.5 million years ago. Libyan Desert Tektite Dimensions: 2.8" x 2.7" x 1.5"
This fine quality natural Libyan desert glass tektite is semi-transparent to transparent with internal layers of inclusions and very interesting surface features. All surfaces are covered with wind-blown sand sculpted surface features in very fine condition and the bottom surface has some very nice naturally crusted areas. 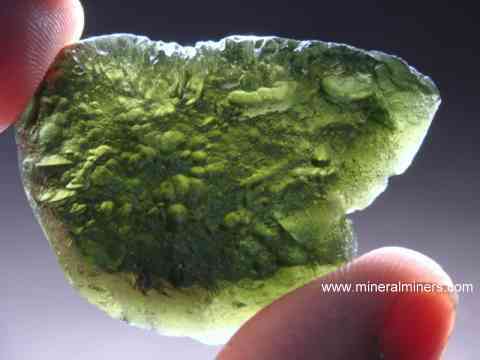 See a bottom side view of this fine quality specimen of natural Libyan desert glass tektite. 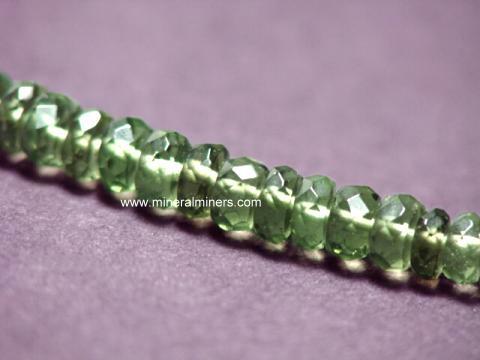 It has golden greenish natural color. Libyan desert glass tektites are a wind sculpted silica-rich natural glass thought by scientists to have been formed by the intense heat produced during a meteoric aerial burst over sand in western Egypt approximately 28.5 million years ago. These natural tektites were collected in Vietnam. They are opaque and have irregular natural rounded shapes with natural pitted surfaces. They are known as "Indochinites", and have been shown by K-Ar radiometric age dating to be approximately 700,000 years old. Scientists believe that the tektite's origin is the result of meteorite impact on the earth. 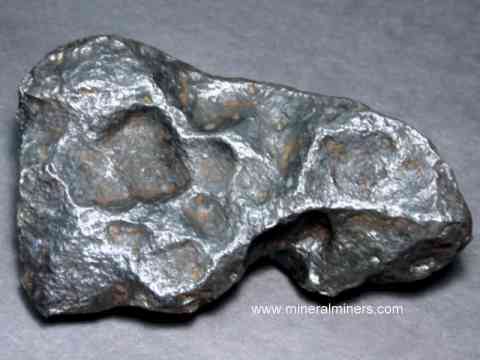 The tektites then formed when molten material, created by the meteorite's hyper-velocity impact, flew through the air hardening into natural glass with aerodynamic forms and surface features. We have two approximate sizes available: 1.3" long, and a larger 1.75" to 2" long size (sizes are approximate). Please see below to order. available in 4 sizes: 2.5" long, 2.8" long, 3.2" long and 3.5" long! These natural tektites were collected in China. They have irregular elongate natural shapes that taper towards one end (drop-like shapes) with natural pitted surfaces. They are known as "Indochinites" (sometimes also called "australiasia" tektites), and have been shown by K-Ar radiometric age dating to be approximately 700,000 years old. Scientists believe that the tektite's origin is the result of meteorite impact on the earth. The tektites then formed when molten material, created by the meteorite's hyper-velocity impact, flew through the air hardening into natural glass with aerodynamic forms and surface features. We have four approximate sizes available: 2.5" long, 2.8" long, 3.2" long, and 3.5" long (sizes are approximate). Please see below to order. Indochinite Tektite Dimensions: 2.8" x 1.2" x 0.7"
This natural Indochinite tektite is opaque and has a flattened potato-like shape with numerous interesting aerial surface features in very good condition. This tektite is known as an "Indochinite", which have been shown by K-Ar radiometric age dating to be approximately 700,000 years old. Scientists believe that this tektite's origin is the result of meteorite impact on terrestial rocks. The tektite then formed when molten rock, created by the meteorite's hyper-velocity impact, flew through the air hardening into natural glass with aerodynamic forms and surface features. 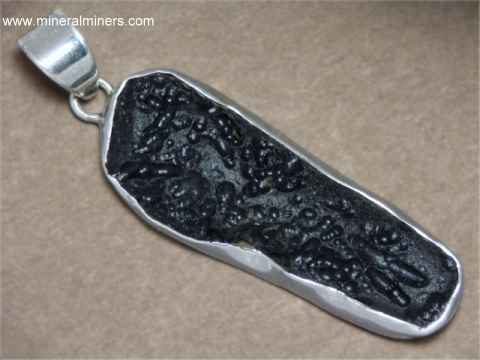 Indochinite Tektite Dimensions: 3.2" x 1" x 0.9"
This natural Indochinite tektite is opaque and has a curving drop-like shape with numerous interesting aerial surface features in very good condition. This tektite is known as an "Indochinite", which have been shown by K-Ar radiometric age dating to be approximately 700,000 years old. 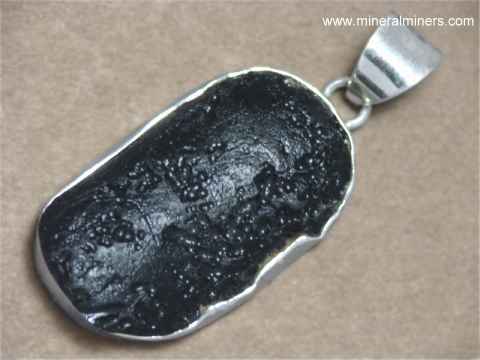 Scientists believe that this tektite's origin is the result of meteorite impact on terrestial rocks. The tektite then formed when molten rock, created by the meteorite's hyper-velocity impact, flew through the air hardening into natural glass with aerodynamic forms and surface features. 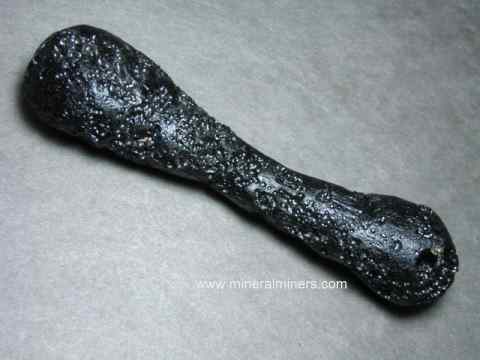 Indochinite Tektite Dimensions: 3.2" x 1.2" x 0.8"
This natural Indochinite tektite is opaque and has a tapering drop-like or drum-stick like shape with numerous interesting aerial surface features in very good condition. This tektite is known as an "Indochinite", which have been shown by K-Ar radiometric age dating to be approximately 700,000 years old. Scientists believe that this tektite's origin is the result of meteorite impact on terrestial rocks. The tektite then formed when molten rock, created by the meteorite's hyper-velocity impact, flew through the air hardening into natural glass with aerodynamic forms and surface features. Indochinite Tektite Dimensions: 3.2" x 0.9" x 0.9"
This natural Indochinite tektite is opaque and has an elongate shape that is slightly larger at each end with numerous interesting aerial surface features in excellent condition. This tektite is known as an "Indochinite", which have been shown by K-Ar radiometric age dating to be approximately 700,000 years old. Scientists believe that this tektite's origin is the result of meteorite impact on terrestial rocks. The tektite then formed when molten rock, created by the meteorite's hyper-velocity impact, flew through the air hardening into natural glass with aerodynamic forms and surface features. Indochinite Tektite Dimensions: 3.7" x 1" x 0.8"
This natural Indochinite tektite is opaque and has an elongate shape that is slightly larger at each end with numerous interesting aerial surface features in very good condition. This tektite is known as an "Indochinite", which have been shown by K-Ar radiometric age dating to be approximately 700,000 years old. Scientists believe that this tektite's origin is the result of meteorite impact on terrestial rocks. The tektite then formed when molten rock, created by the meteorite's hyper-velocity impact, flew through the air hardening into natural glass with aerodynamic forms and surface features. Indochinite Tektite Dimensions: 3.7" x 1.3" x 0.9"
This natural Indochinite tektite is opaque and has a flattened potato-like shape that is slightly curving and slightly larger at each end with numerous interesting aerial surface features in very good condition. This tektite is known as an "Indochinite", which have been shown by K-Ar radiometric age dating to be approximately 700,000 years old. Scientists believe that this tektite's origin is the result of meteorite impact on terrestial rocks. The tektite then formed when molten rock, created by the meteorite's hyper-velocity impact, flew through the air hardening into natural glass with aerodynamic forms and surface features. Indochinite Tektite Dimensions: 4.1" x 1.2" x 0.9"
This natural Indochinite tektite is opaque and has an elongate shape that is slightly larger at each end with numerous interesting aerial surface features in good condition. This tektite is known as an "Indochinite", which have been shown by K-Ar radiometric age dating to be approximately 700,000 years old. Scientists believe that this tektite's origin is the result of meteorite impact on terrestial rocks. The tektite then formed when molten rock, created by the meteorite's hyper-velocity impact, flew through the air hardening into natural glass with aerodynamic forms and surface features. Indochinite Tektite Dimensions: 2.6" x 2.3" x 1.2"
This rare size natural Indochinite tektite is opaque and has a flattened round shape with numerous interesting aerial surface features in excellent condition. This tektite is known as an "Indochinite", which have been shown by K-Ar radiometric age dating to be approximately 700,000 years old. Scientists believe that this tektite's origin is the result of meteorite impact on terrestial rocks. The tektite then formed when molten rock, created by the meteorite's hyper-velocity impact, flew through the air hardening into natural glass with aerodynamic forms and surface features. Indochinite Tektite Dimensions: 4.8" x 1.3" x 1.0"
This rare size natural Indochinite tektite is opaque and has a unique long tapering shape with numerous interesting aerial surface features in good condition. This tektite is known as an "Indochinite", which have been shown by K-Ar radiometric age dating to be approximately 700,000 years old. Scientists believe that this tektite's origin is the result of meteorite impact on terrestial rocks. The tektite then formed when molten rock, created by the meteorite's hyper-velocity impact, flew through the air hardening into natural glass with aerodynamic forms and surface features. Indochinite Tektite Dimensions: 2.9" x 2.9" x 1.1"
This natural Indochinite tektite is opaque with a very large disc-like shape with a hollow in the center. There are numerous interesting aerial surface features in very good condition. This tektite is known as an "Indochinite", which have been shown by K-Ar radiometric age dating to be approximately 700,000 years old. Scientists believe that this tektite's origin is the result of meteorite impact on terrestial rocks. The tektite then formed when molten rock, created by the meteorite's hyper-velocity impact, flew through the air hardening into natural glass with aerodynamic forms and surface features. Indochinite Tektite Dimensions: 5.2" long x 1.6" x 1.3"
This rare size natural Indochinite tektite is opaque and has a long dumbell-like shape with numerous interesting aerial surface features in excellent condition! This tektite is known as an "Indochinite", which have been shown by K-Ar radiometric age dating to be approximately 700,000 years old. Scientists believe that this tektite's origin is the result of meteorite impact on terrestial rocks. The tektite then formed when molten rock, created by the meteorite's hyper-velocity impact, flew through the air hardening into natural glass with aerodynamic forms and surface features. 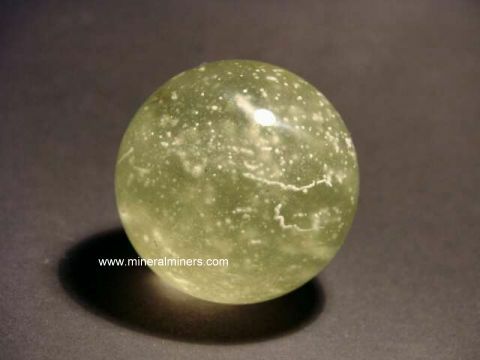 This is a rare quality genuine Libyan desert glass tektite sphere with a very fine quality finish and rich greenish yellow color. 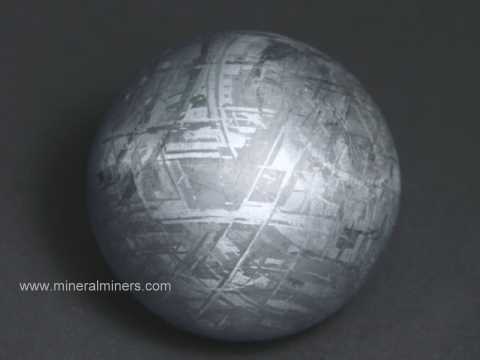 Trapped within this fine quality tektite sphere are some white cristobalite spherules with both individual spherules and stringers. Libyan desert glass tektites are thought to have been formed by the intense heat produced during a meteoric aerial burst over sand dunes in western Egypt approximately 28.5 million years ago. 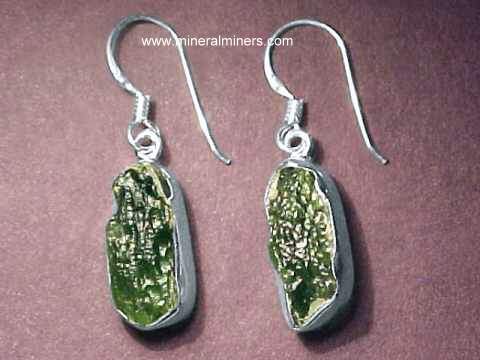 We offer a large selection of natural moldavite jewelry. 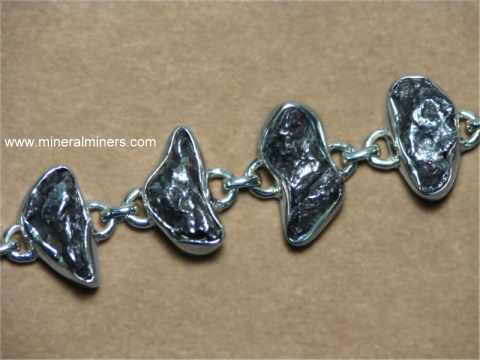 See also our genuine meteorite jewelry page. 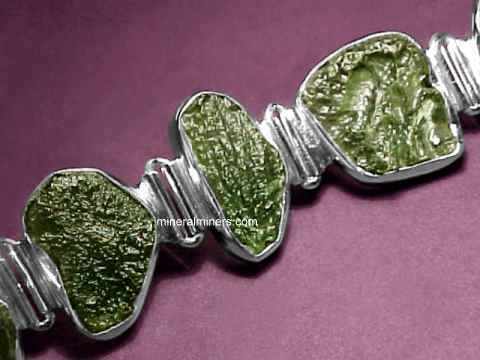 Moldavite is a transparent natural green tektite found in the Moldavia Region of the Czeck Republic. 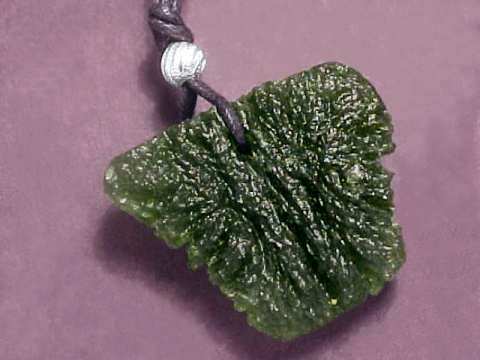 See our selection of natural moldavite specimens. 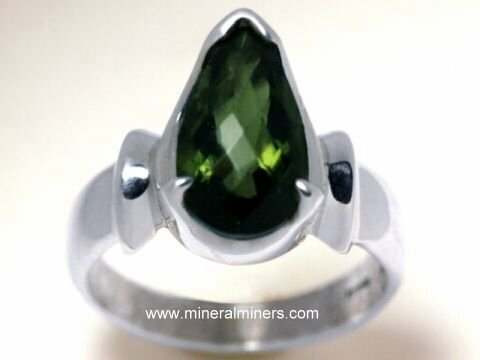 See also our pages displaying natural moldavite jewelry where you will discover beautiful moldavite bracelets, and a large selection of styles and sizes available in moldavite necklaces and moldavite rings. Libyan desert glass is a golden-yellow tektite from a strewn field in the Great Sand Sea of the Sahara Desert region in eastern Libya and western Egypt. Libyan desert glass tektites are found mainly in an arid uninhabited region of tall sief dunes. Local prospectors find these wonderful impactites on exposed bedrock between the dunes. Wind blown desert sands sculpt these attractive tektites into unique shapes with semi-polished natural surfaces. This region is one of Earth's most inhospitable places, and those adventurous enough to trek to this uninhabited region in search of these Lybian desert glass tektites must endure severe dehydration in the dry desert heat - finding a medjool date palm oasis is not likely to happen! 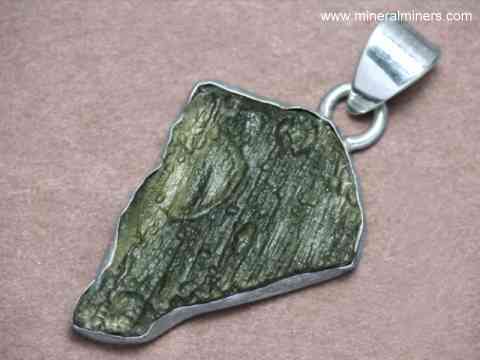 Indochinite tekties are also known as Australasian tektites and Guangdong tektites. They are found in a huge strewn field loacted in south-east asia. Indochinites have been shown by K-Ar radiometric age dating to be approximately 700,000 years old. Scientists believe that these tektites originated from a meteorite impact on terrestial rocks. The tektite then formed when molten rock, created by the meteorite's hyper-velocity impact, flew through the air hardening into natural glass with aerodynamic forms and surface features. 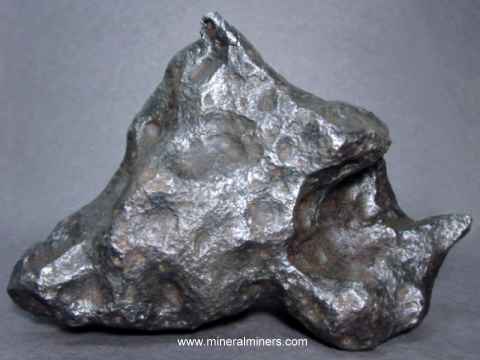 We also offer natural meteorites. Geologists believe that tektites were formed from extreme heat and pressure produced during a meteorite impact on the surface of the earth, which could have melted both the meteor and the surface of the earth itself, fusing them together in a natural glass tektite which would have cooled and hardened very quickly while it fell back down to the earth after the meteorite's explosive impact. 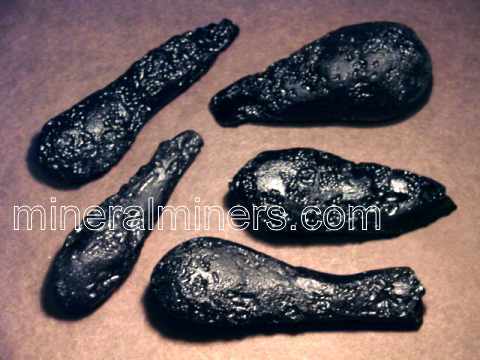 To see more tektite photos, just select another linked tektite image below. To see photos of another mineral variety, select any link in our Mineral Inventory & Factsheet Index. Would you like us to inform you when we add more genuine tektites on this page? 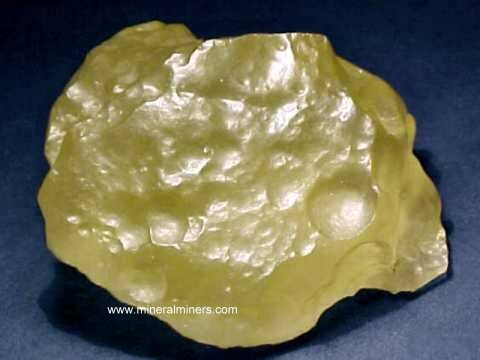 We do have more natural Libyan desert glass tektites, natural moldavite, and natural indochinite tektites in stock at our mineral warehouses, so be sure to let us know if you have any genuine tektite special requests. Please contact our webmaster or our 'site' geologist with any questions or comments. © Copyright 1998 thru 2019 Gem & Mineral Miners, Inc.® All Rights Reserved.